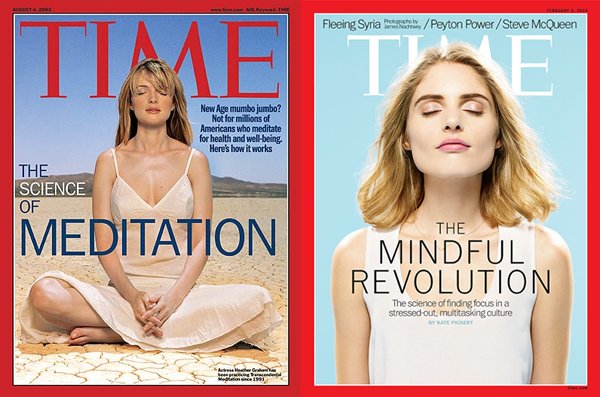 We are amidst the MINDFUL REVOLUTION, but do we have a handle on what mindfulness even is? It is also helpful to note that Contemplative practice, in general, refers to a particular form of observation in which there is a total devotion to revealing, clarifying, and making manifest the nature of reality. Buddhist scholar, Alan Wallace goes into detail about the concept of “contemplation” in science in his book, “Contemplative Science“. The word mindfulness has been literally translated from the Pali root, sati, (or Sanskrit translation, smṛti; Tibetan, dran pa), meaning “that which is remembered”. The term is closely related to the verb sarati referring to the process, “to remember”. The concept of mindfulness has its roots in the classical Buddhist Abhidhamma and is described at length in various Buddhist texts, including “The Heart of Buddhist Meditation” (Thera, 1962), the “Visuddhimagga” (the path of purification) (Buddhaghosa, 1991), and the Satipatthāna sutta (“the foundation [or presence] of mindfulness”) (Analayo, 2003). From the classical Buddhist context, views on the concept of mindfulness vary considerably (Dreyfus, 2011; Dunne, 2011), although most agree the Satipatthāna is one of the most influential texts that describes the foundation of mindfulness as a direct path for “cessation of suffering”, “awakening” or “realization”. The path includes the state of mindfulness as a critical and essential factor, but along with a set of mental processes or factors that must co-arise together. For example, the majority of schools of Buddhism describe the concept of mindfulness as one of four essential mental factors: (1) mindfulness; (2) balanced application of effort (Pali: atapi); (3) an equanimous state of concentration (Pali/Sanskrit: samadhi) free of desire (Pali: abhijha) and discontent (Pali: domanassa); and (4) a form of wisdom or “discriminating alertness” (Pali: sampajana). Also described as “clear comprehension”, some scholars will fuse sati with sampajaña (sati-sampajaña) to illustrate the compound nature of the concepts. Apart from being a basic mental factor, the state of mindfulness is also thought to have the critical quality of monitoring the development and balance of the other three faculties. Furthermore, the Buddhist definition of right mindfulness is ethically discerning, noting the distinction between wholesome and unwholesome states of mind, and then cultivating the former while rejecting the latter. Thus, mindfulness is described as a skill from the Buddhist framework that functions to maintain a continuous state of non-conceptual awareness and meta-awareness with discernment – rooted in an ethical framework. Bodhi, B., 2011. What does mindfulness really mean? A canonical perspective. Contemporary Buddhism: An Interdisciplinary Journal 12, 19 – 39. You may be keenly aware that there are many uses of mindfulness in secular settings and it is defined in ways that capture elements of the Buddhist dharma, but with less continuity or intensity by which it is cultivated through meditative practice and/or commitment to the dharma. In order to avoid too much confusion between contemporary and historical accounts, we need only to understand the differences in context, content, and process by which we refer to the concept. As clinicians, researchers, and basic scientists, we are slowly operationalizing the concept of mindfulness in contemporary settings as a state, trait, and process for stabilizing the mind and developing insight into the nature of our mind – all of the mental habits (perceptual, emotional, or cognitive) that together, create our sense of self. Below, are the varied contexts mindfulness is described and an operational conceptualization from each perspective. This is a temporary moment of paying attention, in a particular way that is absent of emotional reactivity, cognitive evaluations or judgments, and limited to the present moment – not reflecting on the past, or projecting into the future. A momentary state of mindfulness can be induced in a volitional way that does not require one to partake in any form of meditation or have any contemplative practice background. From a clinical context, a therapist may encourage his/her patient to cultivate a STATE of MINDFUL AWARENESS, for the purpose of gaining psychological distance from one’s own maladaptive thoughts and emotions. The state of mindfulness exists variably on a spectrum of continuity and intensity. The intensity of the state relates to the concentration power and clarity of the moment. With low concentration there is high distractibility – with high concentration, there is stability. With low intensity there is dullness, torpor, and fatigue – with high intensity there is perceptual clarity and high arousal from within the phenomenological experience. The continuity of the state of mindfulness relates to the duration of the experiential state. Quite simply, the longer the duration, the longer the state – and thus, greater chance for increased intensity. The idea is that over time and practice, the state of mindfulness is likely, by its very nature, to arise spontaneously without effort throughout our daily life. It may not necessarily be ethically discerning as described in the Buddhist literature, in fact, it likely does not include such a characteristic during a “state-mindfulness induction”; however, through repeated practice, discernment is likely to arise, facilitate prosocial and moral thoughts/emotions – and compete with older anti-social, unethical tendencies. A trait is a dispositional characteristic of cognition, emotion, or behavior that is enduring in nature. If in fact, the state of mindfulness is a skill, then similarly to other skills, some individuals may have a particular innate capacity to culative the state more readily than others. The trait of mindfulness is measured by at least 8 different self-report measures (see Measuring Mindfulness). There is currently no good objective measurement of such a trait. 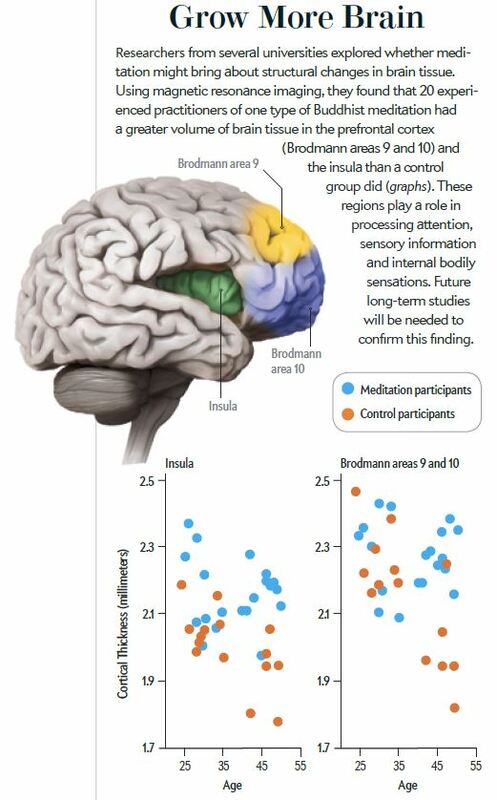 Experience of formal sitting practice has been used to measure the trait of mindfulness as a proxy. “intentionally as an umbrella term to describe our work and to link it explicitly with what I have always considered to be a universal dharma that is co-extensive, if not identical, with the teachings of the Buddha, the Buddhadharma. By ‘umbrella term’ I mean that it is used in certain contexts as a place-holder for the entire dharma, that it is meant to carry multiple meanings and traditions simultaneously….” p. 290. 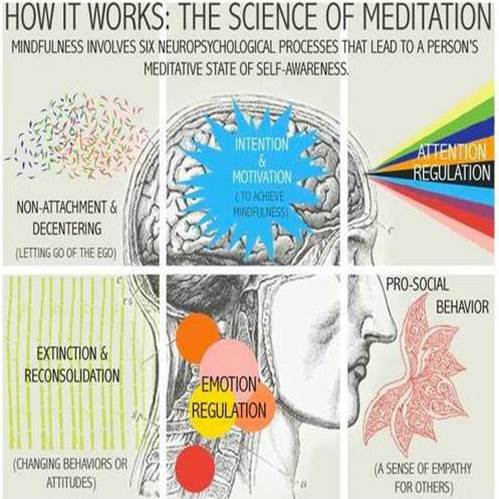 The word meditation in a contemporary cultural context often has the connotation of doing something special to calm the mind or to try and achieve some form of altered state of consciousness. One obvious fact that we tend to forget is that “meditation” is actually an English term and that, when applying it to convey a core element of Eastern spiritual practice, such as that of Buddhism, there might involve unrecognized conflation of meanings. In the classical Buddhist context, however, the term meditation is used to translate the Sanskrit term bhävana and its Tibetan equivalent gom (spelt sgoms). Etymologically, the Sanskrit term connotes the notion of “cultivation,” while its Tibetan equivalent gom carries the idea of developing “familiarity,” together implying the idea of some kind of repetitive process of cultivating a familiarity, whether it is with respect to a habit, a way of seeing, or a way of being. In its actual usage, however, the term gom is applied not only to the process of “cultivation” or “development of familiarity,” it is also applied to the resultant states achieved through such processes. So, in this sense, meditation can refer both to the practice of disciplined cultivation as well as the cultivated result of such a discipline. One can also extend the definition: we are all cultivating our minds in one way or another all the time. The quality of our lives reflects the ways we have cultivated our minds until now. Only MBSR, MBCT, and MBRP involve formal meditation practice. 1. Biofeedback-induced relaxation – The use of a personal computer to send audio and video signals to feedback information about physiological parameters. PMR was originally developed by Edmund Jacobson in 1925 as a technique to gain introspective control over tension. Bishop et al. 2004 – two-component model of self-regulation & present-centered awareness [Link]. 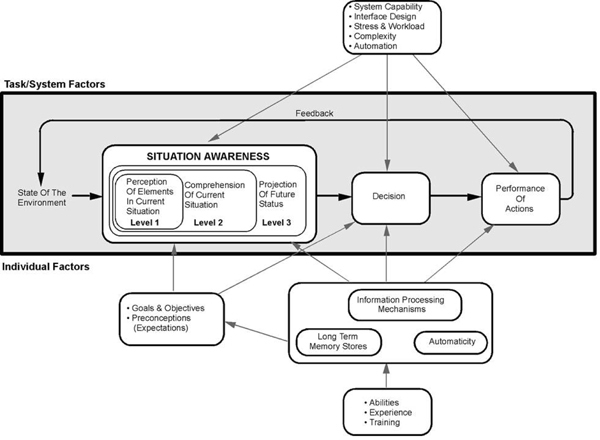 This model describes mindfulness as “an intentional, reflective style of introspection or self-observation”. Bishop characterizes mindfulness as the Open Monitoring form of meditation practice. This is a common characterization which is in contrast to Focused Attention meditation or concentrative meditation. The first component involves the self-regulation of attention so that it is maintained on immediate experience, thereby allowing for increased recognition of mental events in the present moment. The second component involves adopting a particular orientation that is characterized by curiosity, openness, and acceptance. Shaprio et al. describe, “Building on these behaviors (IAA), we propose a model of the potential mechanisms of mindfulness, which suggests that intentionally (I) attending (A) with openness and non-judgmentalness (A) leads to a significant shift in perspective, which we have termed reperceiving. We believe reperceiving is a meta-mechanism of action, which overarches additional direct mechanisms that lead to change and positive outcome. We highlight four of these additional mechanisms: (1) self-regulation, (2) values clarification, (3) cognitive, emotional, and behavioral flexibility, and (4) exposure. These variables can be seen as both potential mechanisms for other outcomes, such as psychological symptom reduction, or as outcomes in and of themselves. Garland states, “the practice of mindfulness (which involves repeated placement of attention onto an object while alternately acknowledging and letting go of distracting thoughts and emotions) engenders a transitory state of mindfulness, which, when engaged repeatedly over time, may accrue into trait or dispositional mindfulness”. Garland proposes that mindfulness practice may facilitate one such strategy, positive reappraisal, i.e., the adaptive process through which stressful events are re-construed as benign, beneficial, and/or meaningful. Our interpretation of mindfulness as a path for reducing suffering and sustaining a healthy mind provides an empirical framework of self-awareness,regulation, and transcendence (S-ART) to illustrate a method for becoming aware of [and familiar with] the conditions which cause [and remove] distortions or biases in the individual‘s construction of his or her external or internal experience. 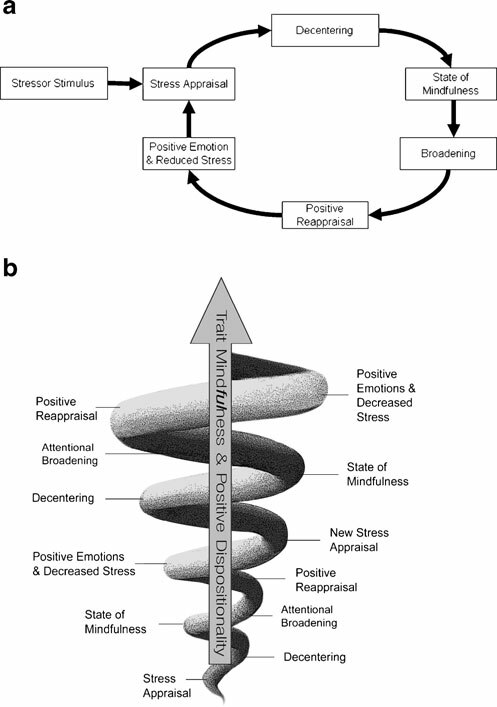 Through training in FA, OM, and EE styles of meditation, a sustainable healthy mind is proposed to be supported – reducing maladaptive emotions and cognitions common to most ordinary experience, such as lustful desire, greed, anger, hatred, worry, etc., increasing pro-social dispositions (e.g., compassion, empathy, forgiveness) towards self and other, reducing attachments to thoughts and feelings, and removing biases inherent in habitual forms of cognition. Although the state of mindfulness has its roots in a number of specific processes related to memory and attention, the concept is more broadly applied as a process/method for stabilizing and developing insight into habits of mind. This process can refer to the quality with which one brings awareness to objects of attention, and in other contexts as the path for reducing suffering and achieving non-dualistic forms of experience. As we continue to investigate mindfulness as an integrative process and method and distinguish the method from the state of awareness, we will better grasp the subtleties of the concept and be able to measure it more effectively and objectively than through self-report measures. Thus, our operationalization of mindfulness does not come from any single process of memory or attention but is best conceptualized through a systems-based framework for a number of different cognitive, psychological, and biological processes involved in cultivating mindfulness as a state and trait and through a systematic form of training the mind that is rooted in an ethical framework. We can then better understand any other contemporary form of mindfulness as an adaptation of this conceptualization and which differs in context, content, and process. Mindfulness as elixir? Mindfulness as mana? I think mindfulness is a mental skill that brings back our attention to object; and it is one type of mental factors, that’s it! If you say how many functions or characters does the mindfulness have ? for me, that is another question, because it depends on our practice, different mental states involve different mindfulness skill, for instance, meditate on impermanence and emptiness come up with different mindfulness, because it is parts of awareness and intelligence, always! one other thing to keep in mind when conceptualizing mindfulness is its use as a state or trait. As a state of mindfulness, it can be conceptualized as Rinchen mentions…as a quality of the mind or mental faculty that co-arises with 3 other qualities: diligence, wisdom, and equanimous freedom from desire and discontent. In this context, the state of mindfulness is a form of awareness and can be more appropriately labeled, “mindful awareness” —- The four qualities can be thought of as qualities that compose a method for developing the mind – such a method can also take the broader definition of mindfulness as a means to developing and sustaining a healthy mind. This method is also described to be applied towards four central domains: the body, feeling states, ethical qualities of mind, and any object of mind that arises. Here I am mindfully aware….in each breath…before I even know it…my attention is expanded – effortlessly conserving cognitive resources – it is more diffuse and alert to a higher resolution of my phenomenal experience – I am efficiently monitoring and evaluating – rapidly discriminating features of the environment as novel or familiar – maintaining equanimity while inhibiting impulses without awareness – the clarity of my senses is intense and unbiased – providing stable emotion to feed the exhale and awareness of the my surroundings without fixating on any thought or sensation. “Only MBSR, MBCT, and MBRP involve formal meditation practice.” Perhaps, that is a broad claim or a misleading statement. Formal meditation practice certainly predated and extends beyond these protocols, in many cultures and traditions. Would including the author or authors of this article help me understand where this point of view comes from? Bias and ego have always existed even in monasteries and health professions, and ill worded comments like this might lead some people to feel aversion to these particularly helpful interventions. I have personally practiced MBSR and do it on a daily basis, starting from an early morning meditation. Mindfulness is becoming popular in the western part of the world and it is hopefully going to give something positive to new generations. It is very interesting to me the approach towards kids at school.